There isn’t a prescriptive code path for the use of DLT under the current IBC, and the NDS doesn’t provide published design values or equations for calculating capacities of wood dowel joints. To calculate capacities, the Timber Framers Guild provides some information. However, because nothing is referenced in the code, the use of DLT would require approval by the Authority Having Jurisdiction on a case-by-case basis. With growing interest in DLT, continued product innovation is likely, along with increased availability to U.S. building designers. 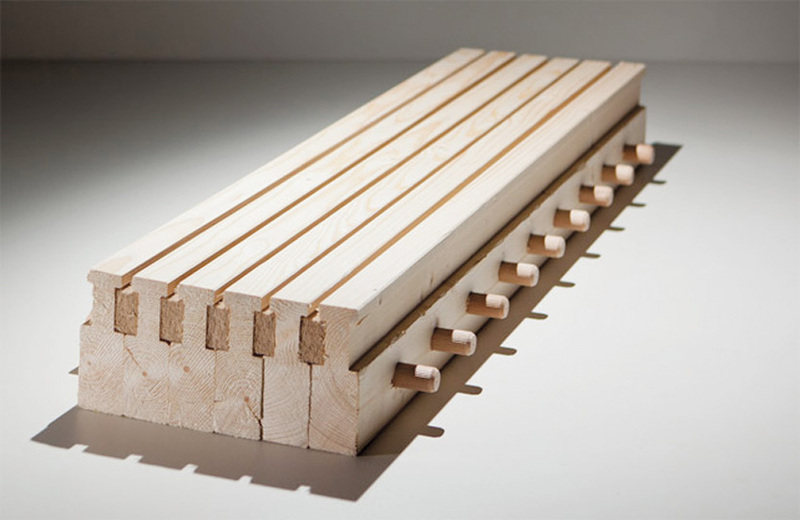 Pictured is a dowel-laminated timber panel with an acoustic profile integrated into the exposed surface. SCL is a family of wood products created by layering dried and graded wood veneers, strands, or flakes with moisture-resistant adhesive into blocks of material, which are subsequently re-sawn into specified sizes. Two SCL products—laminated veneer lumber (LVL) and laminated strand lumber (LSL)—are relevant to the mass timber category, as they can be manufactured as panels in sizes up to 8 feet wide, with varying thicknesses and lengths, depending on the product and manufacturer. Parallel strand lumber (PSL) columns are also commonly used in conjunction with other mass timber products. The manufacture of SCL is standardized. However, while SCL is included in the NDS, design values are provided by the manufacturers. International Code Council Evaluation Service (ICC-ES) evaluation reports and APA product reports are available to assist with structural design capacities and specifications. One example is the University of Massachusetts Design Building described later in this course (see Schools), which includes CLT/concrete composite floors. According to architect Tom Chung of Leers Weinzapfel Associates, the team relied on the CLT panels for the building load requirements. However, the composite action between the CLT and concrete provided extreme stiffness and minimal deflection which, along with an insulation layer between the materials, provided good acoustic separation between floors. In addition to the structural, aesthetic, and environmental advantages, mass timber can be an efficient and practical solution to design challenges. With prefabricated panels, mass timber construction is fast—approximately 25 percent faster than concrete, according to Bernhard Gafner of Fast + Epp, based on his firm’s experience. Gafner says it also results in 90 percent less construction traffic and 75 percent fewer workers on the active deck, making it well-suited to urban infill sites. Because mass timber is lighter than steel and concrete, it can be a good solution for sites where poor soil is an issue. There is also a trend toward the integration of services into prefabricated elements, such as panels and trusses. The fact that the labor is done off-site means greater quality control and a less hectic job site. When is Mass Timber Appropriate? Because of its strength and dimensional stability, mass timber offers a low-carbon alternative to steel, concrete, and masonry for many applications. A complement to other wood framing systems, it can be used on its own, in conjunction with other wood systems such as post-and-beam, or in hybrid structures with steel or concrete. Mass timber is not necessarily a good substitute for light wood-frame construction, only because dimension lumber framing offers such a compelling combination of performance and cost where permitted by code. For this reason, building types where designers typically default to forms of construction other than light wood-frame—including offices, public/institutional buildings, schools, and taller mixed-use occupancies—may offer greater appeal for mass timber than low-rise commercial or residential buildings, though examples of the latter do exist. Thomas Robinson, whose firm is designing three mass timber projects in addition to Albina Yard and Framework, sees particular potential in multifamily housing and other building types that lend themselves to modular prefabrication. “The time spent upfront designing and perfecting a building system can be leveraged in projects where you have repeatable elements,” he says.